Seven Dwarfs Mine Train, in the Enchanted Forest of New Fantasyland (Magic Kingdom), is a family coaster inspired by the film classic “Snow White and the Seven Dwarfs” that takes Walt Disney World Resort guests into the famous mine, glittering with diamonds, rubies, and other precious gems, where the Seven Dwarfs sing happily as they work. 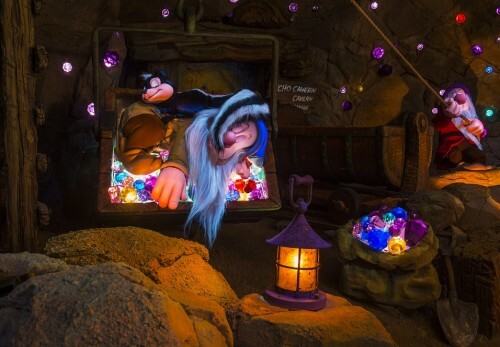 Seven Dwarfs Mine Train is almost completely “on stage.” With its location in the middle of New Fantasyland, guests aboard the rockin’ coaster are afforded amazing views from all angles. 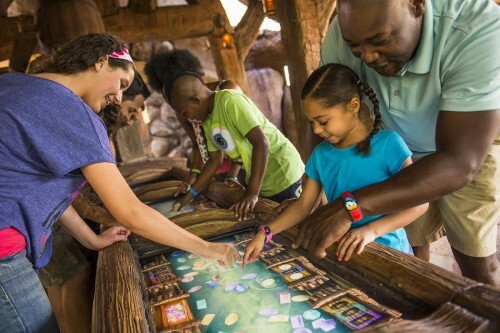 The footprints of forest creatures, large and small, and the impressions of sticks, stones and acorns are embedded in the dirt path that meanders through the Enchanted Forest, leading to the attraction. 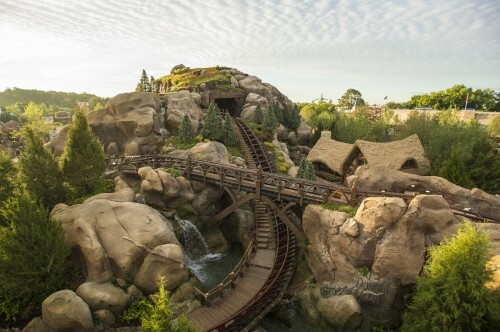 The Dwarfs cottage is a meticulously detailed representation of the cozy home seen in the classic film, down to the wisteria vine and birdhouse at the front door. At the first interactive station in the attraction queue, Doc’s note explains the jewel washing game. As the jewels flow by in a wooden trough, or sluice, guests touch and drag them into a tray on the side of the sluice, matching them by color and shape. The trough is about 15 feet long and is accessible from both sides. At the third interactive station in the queue, “Vault” is carved into the wooden crosspiece, or lintel, above the doorway. This is a reference to the scene in the film where Dopey opens the vault and throws in a bag of gems, then locks the door with a key. For safekeeping, Dopey hangs the key to the vault on a peg next to the door. The key hangs on a peg next to the entrance to the vault in the queue as well. 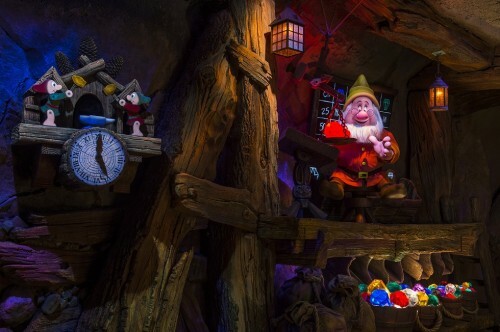 The figures of Grumpy, Doc, Bashful, Sleepy, and Happy, seen in the cottage near the end of the attraction, originally appeared in Snow White’s Scary Adventure, a Magic Kingdom attraction now the site of Princess Fairytale Hall. 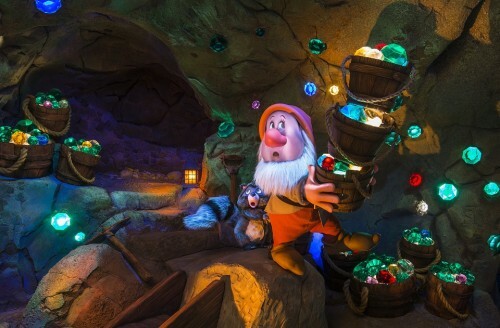 The figures of Snow White, Dopey and Sneezy, in the cottage scene, were created for this attraction. The two vultures perched on the jib crane near the mine entrance are styled after the vultures in the film and originally appeared in the Snow White’s Scary Adventure attraction. 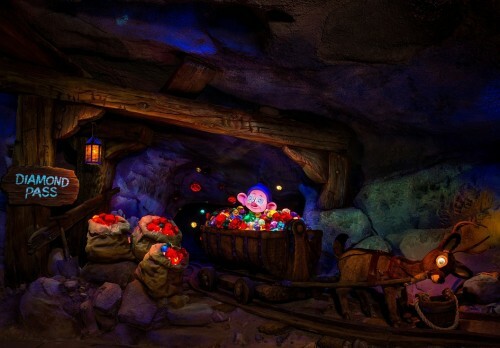 The individual mine cars are designed to reflect similar vehicles that appear in the film, handmade of wood by the Dwarfs, shaped with an ax, and used to haul rocks and jewels. Hand-hammered metal bands and nails are used to bind the wood. In the film, the mine cars sit in a cradle that allows them to be tipped to unload their contents. Here, the cradle design allows the cars to swing back and forth as they carry riders along the winding track. 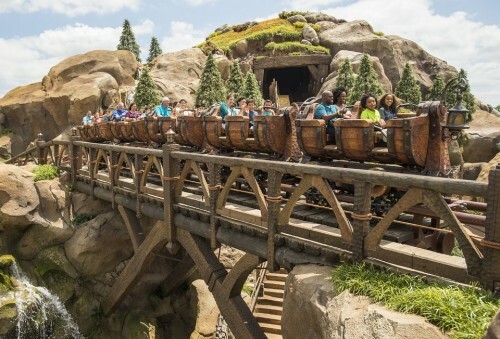 The innovative, patented ride system for the Seven Dwarfs Mine Train is an original design developed at Walt Disney Imagineering. It features five-car trains designed to swing independently from side to side as they move along the track. 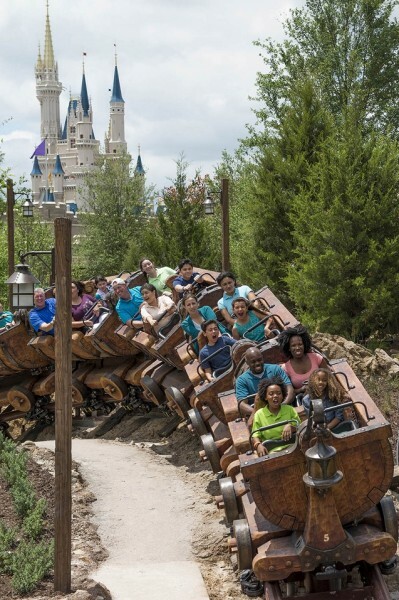 This newly patented design provides a one-of-a-kind ride experience. At the jewel washing station, a melody from the classic film can be created by moving from spigot to spigot. There are 12 spigots, corresponding to the notes of the musical scale. 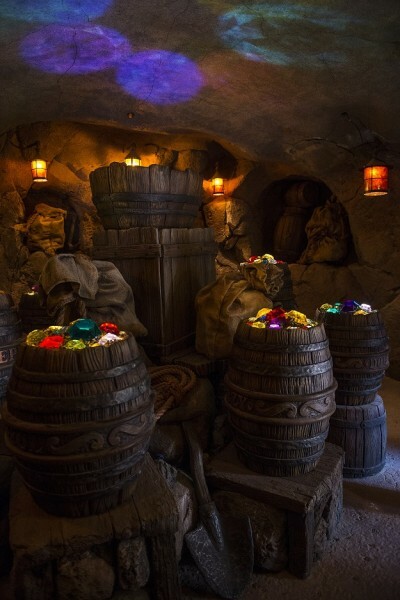 The jewels seen throughout the mine come in four different sizes and six different colors: red, green, amber, purple, blue and clear. 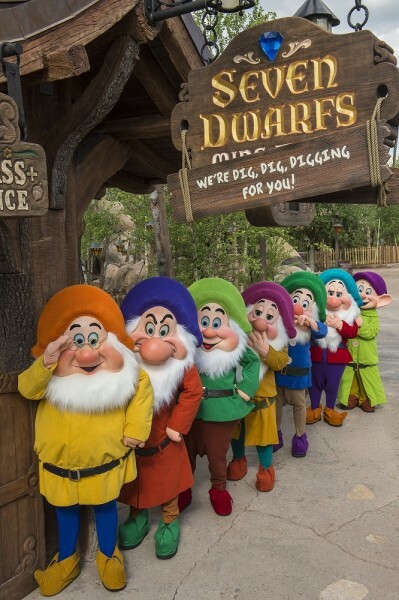 The shadows of the Dwarfs marching homeward along the track on the lift inside of the mine were rotoscoped from the scene in the original film where the Dwarfs march across a log bridge, singing “…home from work we go.” (Rotoscoping is a technique where the movements of a figure in original live or animated footage are copied, or traced, frame-by-frame). At the top of the second lift, guests have a brief moment to enjoy an inspiring view across Fantasyland to Belle’s cottage, Beast’s Castle above Be Our Guest Restaurant, and beyond. Then, the track drops precipitously, passing under a trestle and looping around the mountain crossing over the same trestle. The vehicle picks up speed as it careens down the mountain, twisting and turning, with its cars swinging back and forth. 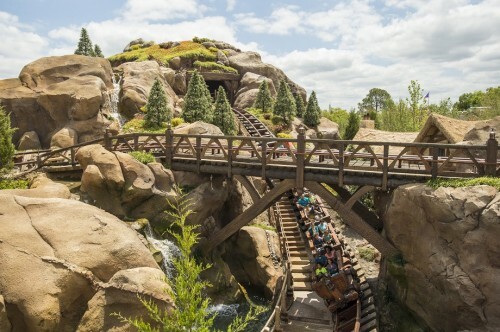 At the foot of the mountain, the mine train loops back to cross a pool at the bottom of a waterfall. In the original tale by the Brothers Grimm, the Dwarfs were unnamed. 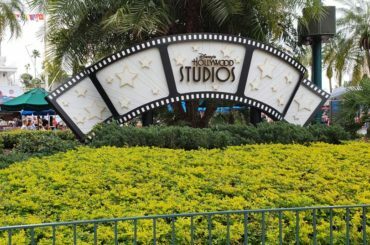 When Walt Disney and his animators decided to name them to correspond with their character, scores of names were rejected including: Wheezy, Jumpy, Baldy, Hickey, Sniffy, Stuffy, Burpy, Tubby, Shorty, Deafy and Dizzy. In the last view of the cottage, around the corner of the far wall, the Wicked Queen can be seen in her disguise as an old hag watching Snow White and the Dwarfs through a cottage window. She turns toward the train as it passes, and cackles wickedly. Now you can win any trivia contest! Which fact, if any, surprised you the most?